all the way up Main Street until it gratefully reached the summit and rolled down Grant Street toward the tunnel - its cargo of salvaged miscellany rattling as it slid forward to clatter against the cab. Swede loved to clean out and organize long-neglected old warehouses and storage sheds and found many a rusty but still-good treasure waiting to be shared and recycled. In the years that Ketchikan was the R&R destination for celebrating loggers heading for the nearest bars, the gentlemen in the tin hats, red suspenders and caulk boots were a wild bunch! They spent their generous wages in some of the downtown bars and often drank too much but all in all contributed heavily to the town's economy both personally and in the impact of their industry. Tom Coyne was Swede's friend. Tom says, "I don't remember ever seeing Swede take a drink and I knew him for 30 years or more. Met him in the Fo'c's'le Bar one morning." The Fo'c's'le was just one of Tom's many stops each morning as he made his rounds of bars. Tom has been an alcoholism counselor for many, many years and his morning rounds were part of his daily routine. Tom is 82 now and says, "Swede was a good man. He was the most down-to-earth person I ever knew, just down to earth." But in due course Ketchikan's logging days became a thing of the past and only a handful of loggers chose to spend the rest of their lives in Ketchikan. Swede was one of them. He did odd jobs around town and was a pretty good carpenter and general handyman. He was part of a past era but he fit in nicely with new. Swede never voiced his opinions until he was asked, but when he did, it was obvious that he did a lot of thinkng and a lot of analyzing. Pretty much everybody knew who Swede was, but he always looked a little surprised when someone new spoke to him. And then one day someone noticed that Swede was missing. People thought back when did they last see him? He was probably last seen on Water Street around Christmastime of 1991. What had happened to the missing old-time logger was a troubling mystery in the weeks before and even long after his body was recovered. His body washed up in Tongass Narrows on March 6, 1992. Was his death an accident? Was it suicide? Or had someone known that Swede had received his permanent fund dividend check about the time of his disappearance and robbed the 76-year-old man. Someone had seen him tuck that check into the chest pocket of his Carharts. Murder was the frightening but nonetheless prevailing rumor. 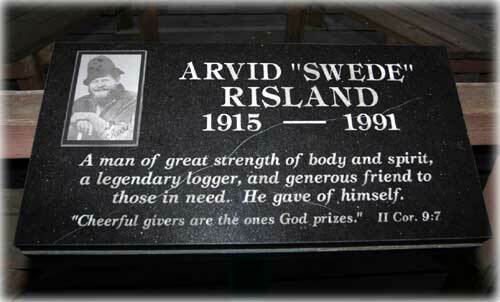 The Arvid "Swede" Risland memorial is located in downtown Ketchikan, Alaska. But murder was so very unlikely! Anyone who knew Swede also knew that he would have cheerfully given that check, endorsed, to anyone who even hinted that he needed it! Swede didn't care that much about money, except to give it away. It was the golden thread that was woven though his entire life. His obituary gave only the bare facts about the man's long and unusual background. The son of Norwegian immigrants Olaf and Sophia Hendrickson Risland, he was born Arvid Risland on July 27, 1915, in Bemidji, Minn., the eldest of 12 children. He was a logger, and said to be the strongest man in Minnesota and maybe even in Alaska! He was a member of the Ketchikan Church of God and the Elks Lodge. His favorite activity was, that final Daily News item of March 12 stated, "Helping people." His body was cremated and his ashes taken back to Minnesota by one of his two sons. In the years of the Great Depression Swede helped on the family's 80-acre farm, a spread that included horses, cows, hogs, chickens, corn, a huge garden and a woodlot with timber which was felled and sold to a nearby pulp mill. During his teen years he gained a sort of local fame for his strength and disposition! And he was a famous man, in his own way, in Ketchikan more than half a century later. In 1988, just weeks before his 73rd birthday, Swede Risland placed second in the power saw bucking competition during Ketchikan's1988 Fourth of July Logging Show! His ability and strength were legendary! This old man could still compete with the young men - and win! What a guy. 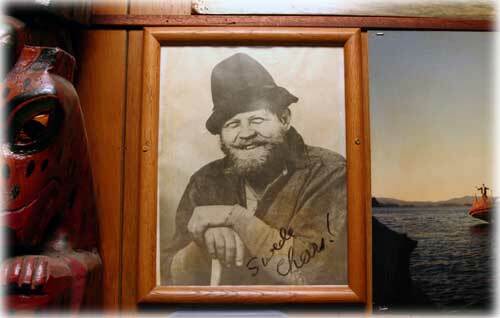 Swede may be gone, but to his legion of friends, his memory - and even his photograph - are still ­ permanently - in Ketchikan. Residents and visitors pass by it every day. 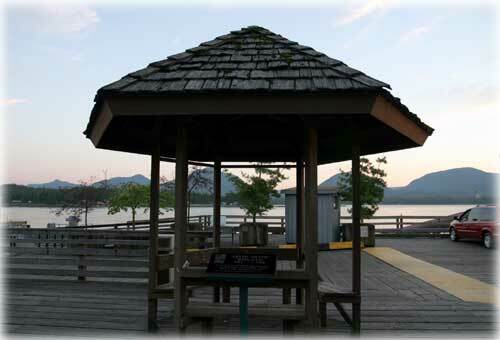 On the water side of Front Street, just down from the gazebo and affixed to the edge of the dock, is a pedestal supporting a bronze plaque dedicated to the memory of Swede Risland, Ketchikan's unlikely philanthropist and most famous logger. Perennial local politician Tom Coyne (who recently confided that he's going to run for City Council again!) visited bars in town in that spring of 1992 and asked for donations to pay for the memorial tribute to Swede. The money to honor Swede was freely given from folks who knew the old logger and those who didn't as well - that's just Ketchikan. Ketchikan Mortuary took care of ordering the bronze plaque. The City allowed the memorial's placement on the dock and handled the installation of the hardware. The Sourdough Bar allowed Swede's formal photograph - which hangs in the bar's famous gallery - to be copied in bronze. Swede had signed that smiling photo "Cheers!" Swede surely inherited his good nature and his unusual strength from his family. The family's uncle, their father's brother Oley Risland, was known far and wide in Minnesota as "a strong man." Swede definitely inherited that trait. The brothers admit that while they were strong, too, they were never as strong as Swede! The Rislands had a pair of big white workhorses they entered in the Bemidji Fourth of July parade each year. One of the horses weighed 1300 pounds! Swede, still in his teens, would lean underneath the belly of the big horse and life its hind legs off the ground. There was an old Hupmobile car that Swede would lift - by the crank! - to demonstrate his strength. As a boy Swede also had what his brothers and sisters called "a wild streak." Sometimes it was a wild and crazy streak! His brothers remember Swede when he was just a teenager, barefoot, wearing a bearskin coat and roaring down the road on a motorcycle in the middle of a Minnesota winter! His brother Melvin once said, "There he was, roaring down the road looking just like a big bear on a motorcycle!" Swede left home when he just 16 or 17. He worked as a hired hand on other farms and went to Montana for the harvest time the help in bring in the wheat crop and sacking potatoes. In the wintertime he hired out to do a little plumbing or basic carpentry or cutting wood. Like most young men of his era, he was hard worker. When World War II broke out, several of his six bothers joined the armed forces. Swede tried to join up, too, but flunked the physical. So he became a civilian worker clearing the right-of-way for the construction of the Alcan, now named the Alaska Highway from Dawson Creek in Canada to Fairbanks. During the war his father moved the family from Minnesota to Oregon, where he worked in defense plants. When the youngest Risland children finished school in Minnesota, they too moved west to join the family. Swede also rejoined his family in Oregon and went to work to begin his logging career. Even though his face was, as they say, "a map of Norway," he was nicknamed "Swede" there, and sometimes referred to as "the Wild Swede." Then in 1952 he moved to Alaska and became part of Ketchikan's informal history. At first he worked in the construction of the pulp mill and it associated facilities as Ward Cove. Ketchikan was a beehive of activity at that time! The town's narrow wooden streets were being widened and paved in anticipation of the pulp mill. Knob Hill that separates downtown from Newtown was shuddering from blasts as a tunnel was punched through it to create a street that would bear the heavy trucks loaded at the docks and then rumbled out to the pulp mill site. Traffic was unbelievable during the whole process, cars queued up on both sides as impatient drivers and passengers waited for flagmen to allow them to continue from one side to the other. The road to Wacker City, now North Tongass Highway, was created from the earlier version of the road out of town. The Forest Service was carving new roads out north for subdivisions for the expected population boom ­ which came. still hangs on the wall of the Sourdough bar. Downtown was booming, too! Several of today's bars and businesses were opened at that time. The Creek Street red-light district was jumping with activity and had spread into the rest of the town as well. The high rises on either end of town would soon be built and Ketchikan businesses were, for the first time, on a cash-and-carry basis! The old charge book practices of the past became just that - part of the past as Ketchikan entered a new economic era. 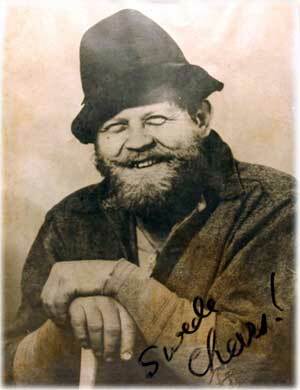 By that time "wild" Swede Risland had headed out to camp and the woods, to earn his reputation as well as his hefty paychecks. Don Finney, at one time an executive director of the Alaska Forest Association, was quoted in a Ketchikan Daily News story after Swede's unexpected death. "Swede was a helluva worker, a wonderful person and I had a lot of respect for him," Finny said. "First at Hollis and then at Thorne Bay after the move in 1962, Swede was a timberfaller, a top busheler at the time. He worked hard and he played hard. "Swede made big money in those days. But he'd come to town and blow it or give it away to someone who needed it more than he did. I remember Art Brooks - he was timber manager at KPC at the time - worried about that. So Art caught Swede in a weak moment and had him sign a contract in which he agreed to have part of his wages withheld. It was something to be put aside for Swede for his old age. Bob Jernberg drew up the contract as I recall. And Swede couldn't take that money out unless someone else signed with him. I think that had to be Art Brooks." Finney recalled. After Finney heard of Swede's death, he mused, "I wonder where that money went." And almost everyone involved at the time is dead now. But Swede would have wanted that money given to someone who really needed it. Over the years many people in Ketchikan were beneficiaries of Swede's kindness and his money. Others know stories of his generosity. When Swede's memorial plaque was dedicated that early summer of 1992, Pastor Bill White of the Church of God, Tom Coyne and a group of friends of Swede Risland gathered on the sidewalk in front of the memorial plaque. Stories of the Wild Swede were shared.